The development of technology and trust in prefabrication caused science fiction and urban planning to find common friends. With the development of spatial bar structures, industrial modular cities made up of three-dimensional systems were starting to be drawn, though still only on paper. This essay covers all the points on the historical spectrum between the invention of the skyscraper (that is, as it was formulated in Delirious New York), the superbuildings referenced in the quote above, and the megastructures developed in the late 1960s by Archizoom and Fumihiko Maki. The activity of celebrating the culture of low, city-like superbuildings is of course fraught with the danger that one will ignore its most city-deadening invention, the plinth. Denise Scott-Brown's 1968 quote is presented as a warning of painting the world with acontextual supercity buildings: "What do they all do up there in those megastructures?" Yet in the last 40 years, superbuilding has not died. It merely needed improving. Like before, during its plinth-era incarnation, it seems to remain a tool for economically efficient consumption. Yet it has survived in many cases only by allowing the cross-pollination of programs to happen, and for public space to infect it. The easiest example of this is The Ehwa Campus Complex in Seoul, by Dominique Perrault. It is a building whose entire roof is either a sloping grassy park or a monumental stair and plaza. The plinth is indistinguishable from the surface of the earth, a hybrid indeed. It has also become commercially unviable for a building to not be contiguous with the city. A good example is OMA's return to fine form with their Bryghusprojektet in Copenhagen. A continuation of the diagonal spatial arrangements found in their 1992 Kunsthal in Rotterdam, the project proposes a 'heaping' of different programs to create hybridization, overlap, and new connections. However it does so by being contiguous to the ground of the city at many points along its edges. 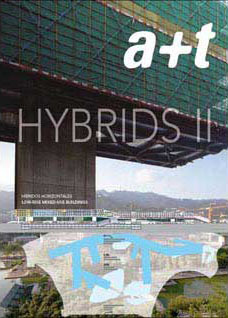 What's astonishing in this book's survey is not only the scale of the projects being undertaken (such as the 100,000 square meter sporting complex in Kuwait, or Steven Holl's Vanke Center in Shenhen, China) but the diversity of solutions being proposed by architects. Megabuilding has taken on any form imaginable, making material the the possibility in ultra-dense city-scaled structures.